I made a quick salad for lunch today with half of the lettuces and cucumber. The plan: stir fry with bok choy and snap peas, steamed bok choy and snap peas, roasted carrots and leeks. Also, I saw a post on Thug Kitchen for a salad with roasted strawberries. It sounds great so I am going to make it tomorrow for lunch! That is a beautiful bounty. Enjoy! 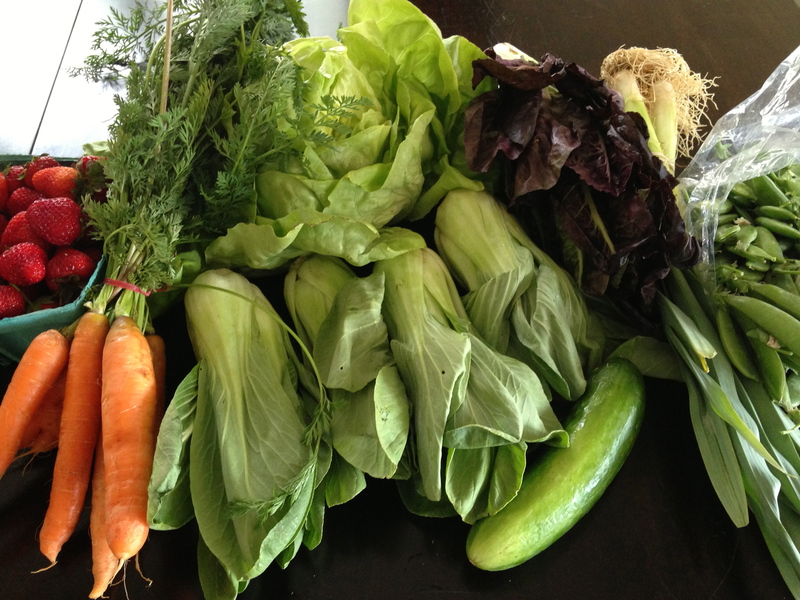 Beautiful haul this week – yay for CSA season! Loving your idea for roasted leeks and carrots. I am looking forward to a trip to the farmers market this week, too… I may just have to borrow your suggestion! 😉 Happy Sunday! Beautiful haul this week! So excited for CSA season to be on! I love your idea for roasted carrots and leeks — I may just have to borrow the suggestion after my trip to the farmers market this week. Happy Sunday!